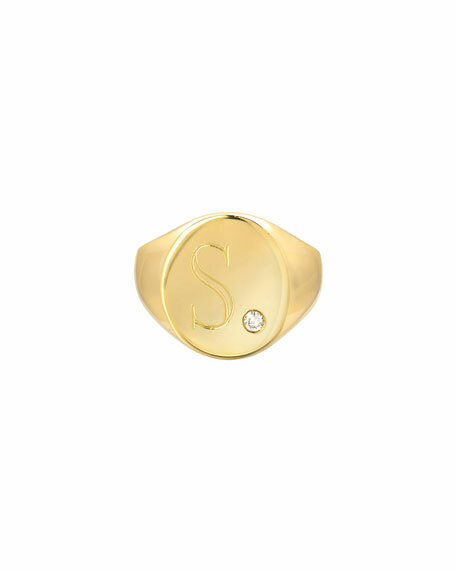 Large signet ring with diamond by Zoe Lev Jewelry. Solid 14-karat yellow gold with engraved initial. Choose one letter in block or script font. Single tiny round white VS diamond accent. Lollitini Sterling Silver Necklace in Eclipse, 16"
Armenta stackable ring from the New World Collection. Sterling silver with matte finish. Crivelli stations with champagne diamonds. 0.19 total diamond carat weight. Approx. 0.2" (4mm) wide.